Here is an excerpt from an article written by Chris Zook and James Allen for Harvard Business Review and the HBR Blog Network. To read the complete article, check out the wealth of free resources, obtain subscription information, and receive HBR email alerts, please click here. All too often, however, companies lose the founder’s mentality as they become larger. The pursuit of growth and scale adds organizational complexity, piles on processes and systems, dilutes the sense of insurgency, and creates challenges in maintaining the original level of talent. These sorts of deep, subtle internal problems, in turn, lead to deterioration on the outside. 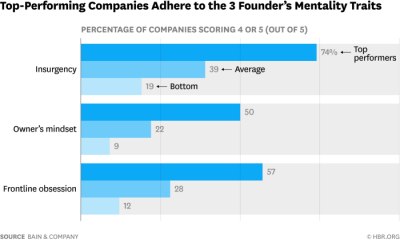 The chart below, based on a global survey we have conducted of 325 executives, shows the decreasing degree to which company leaders perceive the founder’s mentality at work in their own company, depending on its size. James Allen is a partner in Bain & Company’s London office and a co-head of the firm’s global strategy practice. He also leads Bain’s Developing Market 100 initiative. He is a co-author of a number of bestselling books including aforementioned Profit from the Core and The Founder’s Mentality (Harvard Business Review Press, June 2016).